You will think you are south of the border when you try this recipe. 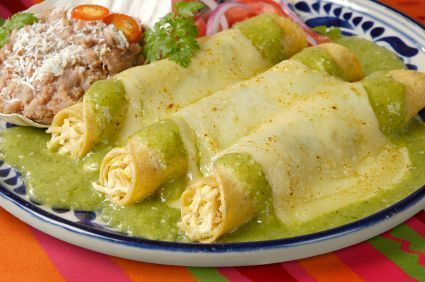 It is a meal- one enchilada will fill you up- it did me! You will think you are south of the border when you try this recipe. It is a meal- one enchilada will fill you up- it did me! Place chicken breasts into a saute pan. Cover poultry with water and place on stove top over moderate heat. Be sure to keep the heat of the water at 185 degrees. One of the best ways to tell if you are within the correct range is to just look for tiny bubbles every so often. Poach poultry for about 20 minutes or until meat reaches 165 degrees internal temperature. Remove meat from poaching liquid to cool. Once cooled cut into 1/4 inch cubes and reserve. In a large saute pan heat butter until foaming. Add chopped onion to sweat. Cook for 1-2 mintues. Add mushrooms to the pan and continue to saute for 2-3 minutes. Add jalapeno and spices to the pan, stir to combine. Add spinach to pan and cook just until wilted. Combine milk with sour cream. Pour 2 tablespoons of the mixture into the sauted vegetables, stir to combine. Simmer for 1-2 mintues. Add diced chicken to the pan, remove from heat. Spray a 8 X 10 inch baking dish with pan spray. Run tortilla wraps under cool water to soften. Place onto a cutting board. Fill each wrap with 3/4 cup of filling, fold and close into an enchilada style packet. Place fold side down into baking dish. Cover with remaning sauce, cheese, and green chiles. Bake 15 mintues. Makes 4 enchiladas, one per serving.